My family. To begin with it had no part or share in what I was doing. Having set forth from that place, it was only natural I should return to it, given the accuracy of my navigation. And my family could have moved to other quarters during my absence, and settled down a hundred leagues away, without my deviating by as much as a hair's-breadth from my course. As for the screams of pain and wafts of decomposition (assuming I was capable of noticing them), they would have seemed to me quite in the natural order of things, such as I had come to know it. If before such manifestations I had been compelled each time to turn aside, I should not have got very far. Washed (on the surface only) by the rains, my head cracking with unutterable imprecations, it was for myself I should have had to turn aside, before all else. (After all perhaps I was doing so: that would account for my vaguely circular motion.) Lies, lies: mine was not to know, nor to judge, nor talk, but to go. The hard knocks they invented for me! But the bouquet was this story of Mahood's in which I appear as upset at having been delivered so economically of a pack of blood relations (not to mention the two cunts into the bargain: the one for ever accursed that ejected me into this world and the other, infundibuliform, in which -- pumping my likes -- I tried to take my revenge). To tell the truth (let us be honest at least), it is some considerable time now since I last knew what I was talking about. It is because my thoughts are elsewhere. I am therefore forgiven. So long as one's thoughts are somewhere everything is permitted. So let us consider now what really occurred. Finally I found myself, without surprise, within the building (circular in form as already stated, its ground-floor consisting of a single room flush with the arena) and there completed my rounds -- stamping under foot the unrecognizable remains of my family (here a face, there a stomach, as the case might be), and sinking into them with the ends of my crutches, both coming and going. To say I did so with satisfaction would be stretching the truth. For my feeling was rather one of annoyance at having to flounder in such muck just at the moment when my closing contortions called for a firm and level surface. I like to fancy (even if it is not true) that it was in mother's entrails I spent the last days of my long voyage, and set out on the next. (No, I have no preference: Isolde's breast would have done just as well, or papa's private parts, or the heart of one of the little bastards.) But is it certain? Would I have not been more likely, in a sudden access of independence, to devour what remained of the fatal corned-beef? How often did I fall during these final stages, while the storms raged without? But enough of this nonsense: I was never anywhere but here, no one ever got me out of here. Enough of acting the infant who has been told so often how he was found under a cabbage leaf that in the end he remembers the exact spot in the garden and the kind of life he led there before joining the family circle. There will be no more from me about bodies and trajectories, sky and earth -- I don't know what it all is. They have told me, explained to me, described to me, what it all is, what it looks like, what it's all for (one after the other, thousands of times, in thousands of connections), until I must have begun to look as if I understood. Who would ever think, to hear me, that I've never seen anything, never heard anything but their voices? (And man! The lectures they gave me on men, before they even began trying to assimilate me to him!) What I speak of, what I speak with, all comes from them -- it's all the same to me. But it's no good, there's no end to it. It's of me now I must speak, even if I have to do it with their language. It will be a start, a step towards silence and the end of madness: the madness of having to speak and not being able to -- except of things that don't concern me, that I don't believe, that they have crammed me full of to prevent me from saying who I am, where I am, and from doing what I have to do in the only way that can put an end to it, from doing what I have to do. How they must hate me! Ah a nice state they have me in -- but still I'm not their creature (not quite, not yet). To testify to them, until I die (as if there was any dying with that tomfoolery): that's what they've sworn they'll bring me to. Not to be able to open my mouth without proclaiming them, and our fellowship: that's what they imagine they'll have me reduced to. It's a poor trick that consists in ramming a set of words down your gullet on the principle that you can't bring them up without being branded as belonging to their breed. But I'll fix their gibberish for them. I never understood a word of it in any case -- not a word of the stories it spews, like gobbets in a vomit. My inability to absorb, my genius for forgetting, are more than they reckoned with. Dear incomprehension, it's thanks to you I'll be myself in the end. Nothing will remain of all the lies they have glutted me with. And I'll be myself at last (as a starveling belches his odourless wind, before the bliss of coma). What is strange is that they haven't been pestering me for some time past (yes, they've inflicted the notion of time on me too). What conclusion, using their methods, am I to draw from this? Mahood is silent: that is to say his voice continues, but is no longer renewed. Do they consider me so plastered with their rubbish that I can never extricate myself, never make a gesture but their cast must come to life? But within, motionless, I can live, and utter me, for no ears but my own. They loaded me down with their trappings and stoned me through the carnival. I'll sham dead now, whom they couldn't bring to life, and my monster's carapace will rot off me. But it's entirely a matter of voices: no other metaphor is appropriate. They've blown me up with their voices, like a balloon, and even as I collapse it's them I hear. Who, them? And why nothing more from them lately? Can it be they have abandoned me, saying "Very well, there's nothing to be done with him, let's leave it at that, he's not dangerous"? Ah but the little murmur of unconsenting man, to murmur what it is their humanity stifles! The little gasp of the condemned to life, rotting in his dungeon garrotted and racked, to gasp what it is to have to celebrate banishment! Beware! No, they have nothing to fear. I am walled round with their vociferations. No one will ever know what I am, none will ever hear me say it: I won't say it, I can't say it, I have no language but theirs. No, perhaps I'll say it (even with their language), for me alone -- so as not to have not lived in vain, and so as to go silent. (If that is what confers the right to silence -- and it's unlikely: it's they who have silence in their gift, they who decide, the same old gang, among themselves.) No matter, to hell with silence: I'll say what I am, so as not to have been born for nothing. I'll fix their jargon for them. Then any old thing (no matter what, whatever they want), with a will, till time is done -- at least with a good grace. ¡ en todos lados sucede ! and why it does not end ? "They've inflicted the notion of time on me too"
This phrase struck me: the worst of all measures. It's not surprising that in these monstrous photographs we can catch something of our own prisons. Perhaps the most consoling quality in the writings of Samuel Beckett is the constant reassuring rejection of humanism, including, especially, all those assumptions in humanism which make possible sentimentality of all kinds, the overvaluation of one's own biology and the biology of one's blood kin, in particular. 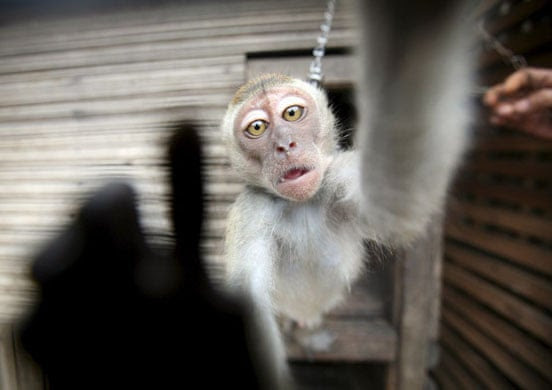 Historical human slavery is a cultural feature which in itself reflects the deep falsity in the belief that human cleverness, the pitifully weak foundation of all claims to human superiority over other primate species, privileges humans to practise upon one another forms of cruelty unknown among all other primates. Human slavery is now illegal everywhere yet is still practised, under various transparent guises, in many parts of this planet ruled by the ugly, terminally sick apes at the top of the power chain. A primary site is China, where humans on the low end of the wage scale are made to do hideous work 16 hours a day in order to earn enough to live through another day of same = slavery. 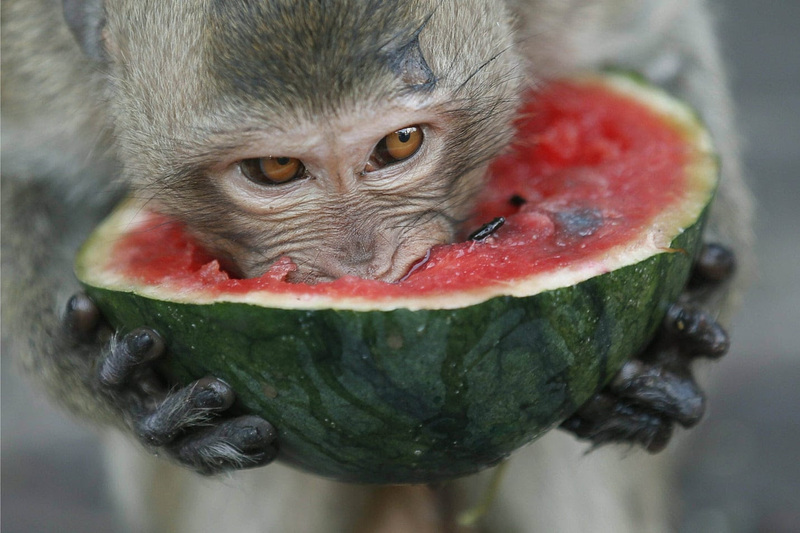 The Chinese, among primates the cleverest, sickest, least respectful group, do a great deal of monkey business involving fellow primates; with the current increase of wealth among the Chinese middle classes, the market in monkeys is booming. A pet monkey, bought as a baby, starts out cute and cuddly (and of course scared and vulnerable, having been ripped away from its mother and family), but then turns into a stunted version of a grownup monkey -- strong, unpredictable, wanting to be wild. Owners of these de-natured pets perform various prescribed rituals to keep their slave animals subdued -- that is, "quiet", as Bibi would say. 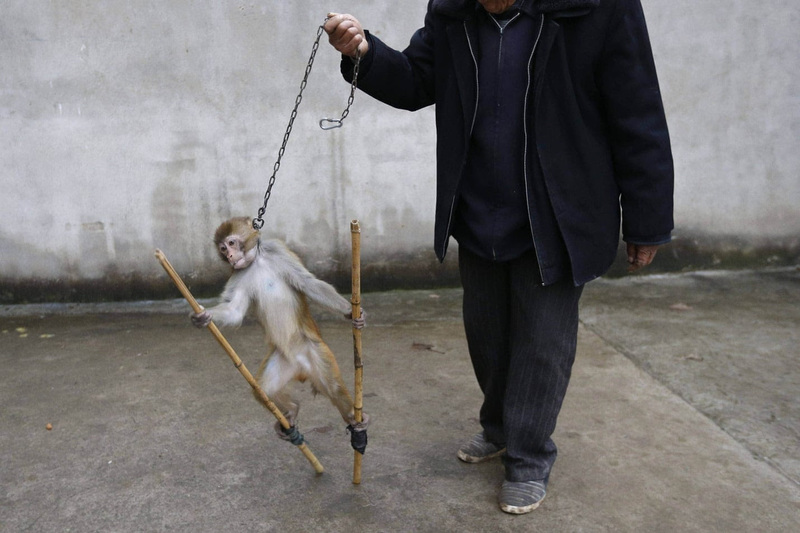 Confinement in small enclosures, chaining, shocking, beating, and removal of teeth and nails to prevent scratching and biting are practises commonly employed by Chinese primate-pet owners. 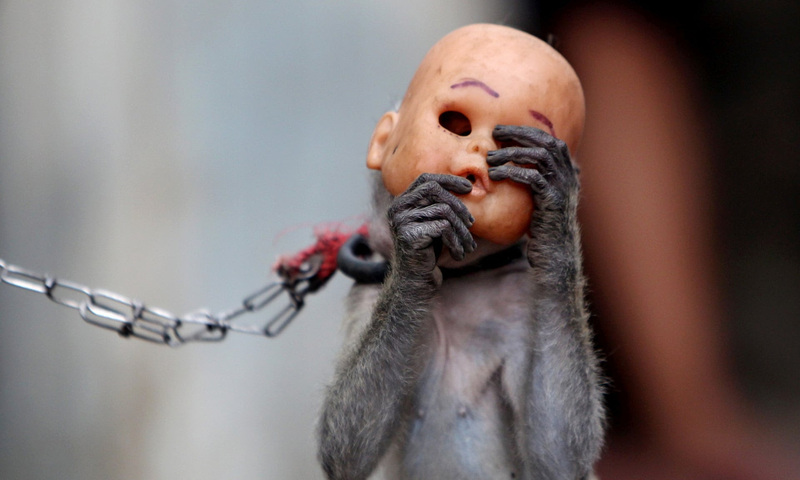 The terrible monkey-business "theatre", or "street monkey show", is now regarded as something of an embarrassment in Jakarta; watching animal torture, it turns out, while great fun for local audiences, is a bit of a turn-off for the shrinking-violet element in the tourist trade; there has actually been talk of regulation (and of course regulation would merely amount to removing the shows from open public view to clandestine spaces). 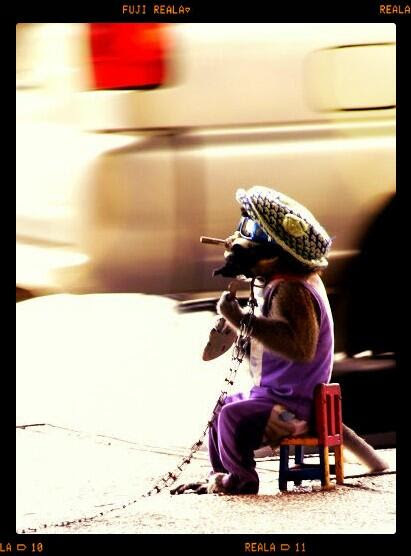 In China the street monkey antics proceed full-on. In this video (and by the by there are way too many of these online), one may observe a typical sample of the fun. 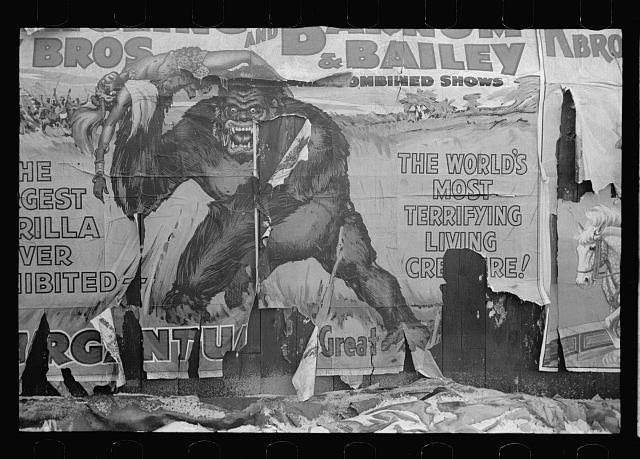 The "trainer" or "handler", whose long systematic abuse of his primate "performers" is writ in every aspect of their aberrant, terrorized, totally unnatural behaviour, concentrates his attentions upon a single "performer", provoking it to be "naughty" -- for which transgression, at 7:00, the animal is doled out an extra degree of punishment (that is, over and above the simple beating with whip and thong and menacing with stun gun or no, real gun): to the great glee of the crowd on onlookers, many of them small children, a surgical glove is forcibly slipped over the animal's face by the "handler", preventing, among other things, breathing. The animal, thus "pacified", with forelimbs string-tied behind back, slumps from obedient-kneeling to supine posture, and remains so, inert, for the next six minutes; until, that is, the "handler" commands another "performer" to drag away the supine, bound, suffocating "transgressor" by its tail. A trick which doesn't go so well. The tourist who makes this video reports that he was charged -- by an opportunistic fellow spectator -- 81 cents for the privilege of observing the show. 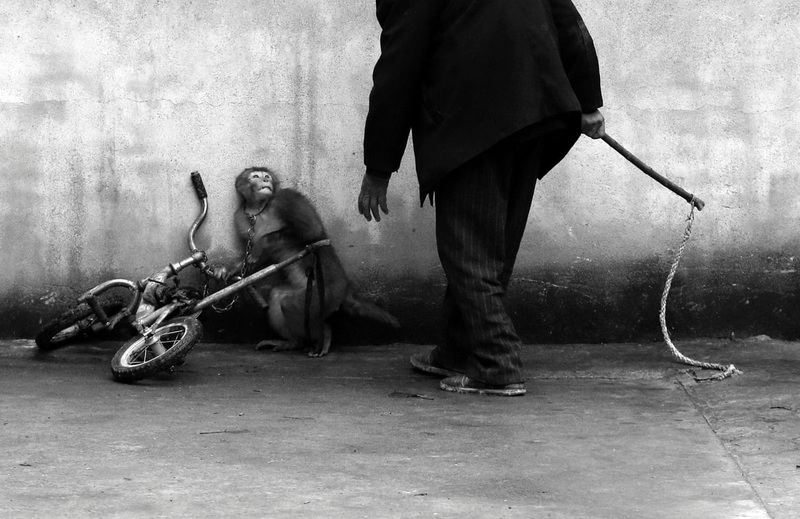 Viewers of the video have annotated this atrocity exhibition spectacle with several pages of comments, some expressing outrage, some expressing disappointment that the cruelty doesn't go far enough -- the monkey isn't doused with lighter fluid and set fire to, as a climax, for example. Beckett talks about language, perhaps by extension, the market- what it is to have respect for something beyond the human ken? Tom, all of what you say about how human beings treat other humans and other animals is, sadly, quite true. I'm not sure if that exhausts the meaning of the word humanism, though. Grateful for the generous, thoughtful and intelligent commentary by everybody. Beckett, Rimbaud yes -- now and then there's somebody who just can't get with the human program, thank dog. Pleased that billoo has caught me out for playing fast and loose with humanism like that. Thus proceeds dialogue. Coincidentally I've been re-reading So Human An Animal, the 1969 book in which microbiologist René Dubos advanced his view of the way in which homo sapiens is shaped by environment, and how, in turn, homo sapiens uses such forces as urbanization and technology to control environment. It is a foundational text of modern "enlightened" scientific humanism. Dubos proposed that global problems conditioned by local circumstances and choices should and thus necessarily would be addressed by new kinds of thinking made possible by social evolution, enabling the species to rethink human actions and change direction to bring about an ecologically balanced environment. And yet, in this key work of optimistic scientific humanism, Dubos conceded that through its characteristic tendency to attempt to transcend simple biological (i.e. animal) urges, the human species is prone to converting ordinary processes of existence into something else again -- "actions, representations and aspirations that have no biological necessity and may even be inimical to life". Homo sapiens, Dubos admits, can never fall back on its biological instincts, because they have been so successfully "transcended". Personal, individual choices outweigh instinct and collective understanding in humans. This, he suggests, is called progress. Irrational progress, you ask? "The response of any given person to an environmental factor is conditioned both physiologically and psychologically by his own past experiences; it is therefore highly personal. The power of the personal past is so great that it can distort the meaning of any event and magnify trivial happenings into momentous experiences. Human reactions are so profoundly influenced by the individual past that they are usually unpredictable and therefore appear completely irrational." Humans, in short, are blind, bumbling, brilliant, irrational, chronically shortsighted and selfregarding, and total wizards. What Dubos in 1959 calls "the biological remembrance of things past" has already by that time grown dim, as he acknowledges. In the early darkness of proliferating global environmental problems, Dubos, with the support of the Rockefeller Foundation, foresaw a future in which new technologies and new cities would arise out of the muck and jumble of things to set the planet on course once more, running along more or less smoothly, as it had been, before this short-term-thinking, selfish, deeply irrational individualist homo sapiens had shown up on the scene, armed with his brilliant scientific humanistic optimism kit. Right. And all that worked out wonderfully. The well meaning Naomi Klein has been touring hard behind her book on climate change and the destruction of the planet. In the book she describes a kind of Eureka moment. She's on tour, flying from Charleston, South Carolina to DC. It's a hot summer day. The plane can't take off because the tires have sunk four inches into the melting tarmac. Everybody is made to get off the plane, to lighten its load. Plane still won't roll. This and that rig has to be hauled out, and finally it's three hours before the plane is up, up and away into into the foul, stinking American air. Klein's point in describing this episode is that runways aren't supposed to melt. In my mind while reading her words was the thought that if Klein really expected anyone to believe her message, she'd not have got back on that plane. She'd not have got on another plane. She'd not have got into a car, or a taxi, or a bus, or any of those other forms of carbon-spewing conveyance. Her personal, individual decision to put her book tour above all other possible choices of action, and in fact, in doing so, to contribute personally to the carbon overload her book laments, is a sensible, modern, humanistic decision. That's the problem with enlightenment and humanism and technology and the human project. There are as many versions of it as there are modern, individualistic, technologically advanced, personally unique, perpetually selfcentered human beings with smartphones. Nature, though, what's that, again? Tom, this is a profound way of thinking: "the biological remembrance of things past". Perhaps only a shaman/poet can think in that way now? Your comments reminded me of something Hans Jonas once wrote ('the Phenomenon of Life): before the modern period the Spirit was everywhere (or at least there was some sort of continuity). And now there's only dead matter, "pure extension", soulless machines. 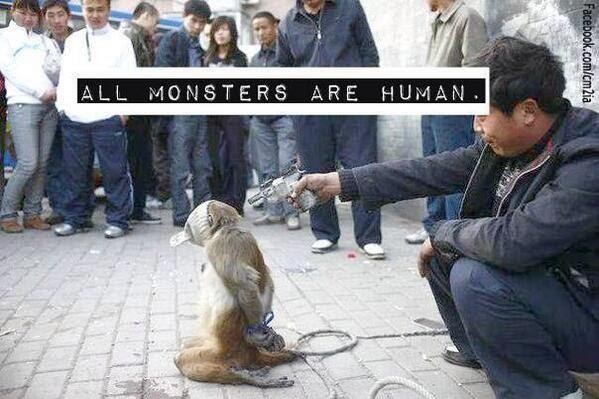 I wonder if it all started when we began to think of animals as nothing more than beasts or brutes? I think maybe, if we were in a utopian mood and wished to start our relations with other species all over, the first good faith step in the negotiation would be to quit eating them.